Over the past eighteen years SSE has had the privilege of working with a wide variety of clients in our specialized markets. 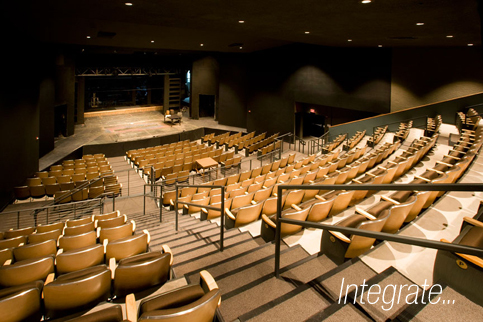 We have completed hundreds of new, renovation and retrofit projects ranging from small lecture halls for both private and public clients to 2,000 seat sanctuaries for some of the nation’s largest worship centers. In addition, we have extensive experience in the cinema market with projects ranging from a single screen 100 seat auditorium to a twenty two screen megaplex including IMAX large format auditoriums. Regardless of what our assignment has been, we have approached each project with the same attention to detail and the highest level of customer service in the industry. This philosophy has allowed SSE to build a significant list of repeat clients with more than 20 individual projects for some select clients. Having worked with a wide variety of clients in the Cinema, Worship, Educational, Government, Corporate and Live Entertainment industries, SSE realizes that diverse project types can require a different approach to meet specific needs and requirements. The economical nature of the SSE PREFOAM Stadium Seating Riser Systems is always a primary concern, however, depending on the market sector, other priorities take precedent for differing clients. Our ability to service this variety of needs including stringent scheduling and phasing requirements, solutions with specific weight and loading requirements and projects where acoustic considerations are critical require the personal attention of our team and tailoring our services. The SSE PREFOAM Stadium Seating Riser Systems maximize the productivity and time for the installing contractor. This, in turn, allows the facility owner to occupy the venues as soon as possible and begin producing revenue or providing services long before conventional methods of construction would allow. SSE can also recommend outside installation contractors with prior PREFOAM Stadium Seating Riser Systems installation experience to work with the general contractor for a fast and easy installation. As ownership in SSE has a professional background in Architecture/Engineering, we can successfully respond to design professionals in a collaborative manner focused on providing the best possible design criteria solution. Following the initial layout of the tiered seating, the SSE team will proceed from the design development stage to provide alternative ideas regarding the system assembly and methods of achieving functionality for the client. During the construction document preparation, our staff can provide not only a complete set of shop drawings, but also AutoCAD details and specifications for the Architect/Engineer of Record for the PREFOAM Stadium Seating Riser System design to be incorporated into the final A/E bid package. With the exception of stamped Structural Engineering drawings and calculations, the SSE installation shop drawings are fully developed for each component and each level of the stadium seating. In many cases this alleviates the need to supply additional design or engineering by the A/E Team. This approach will reduce design costs for the Architect and the Client and contributes to a comprehensive solution to the PREFOAM Stadium Seating Riser System design. If structural engineering design and calculations are required for the stadium seating riser system, SSE can recommend a registered professional engineering consultant to be added to the team. These consultants will have specific experience providing engineering designs and calculations for the SSE PREFOAM Stadium Seating Riser Systems as required by the jurisdiction of the project. “I cannot recommend Frank Moson more highly. Frank and I began working together around 2005 on a stadium seating retrofit project where he orchestrated the new seating concept into a reality for a general contractor unfamiliar with the system. He was attentive to the details of all aspects of the work and explained carefully what and how things needed to be done in order to accomplish the finished product. Over the eighteen years we have found that Contractors and Subcontractors are some of the biggest supporters of using the SSE PREFOAM Stadium Seating Riser Systems. With the SSE PREFOAM Stadium Seating Riser System, each specific cost for the installation of the system is spelled out from day one. There are no surprises and no hidden costs. 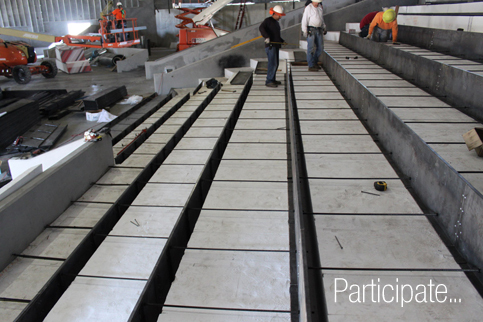 In more than 90% of the time, it will be the contractors first time ever installing an EPS Geofoam stadium seating system. In virtually every case, after the first round of installations, they have concluded that the SSE PREFOAM Stadium Seating Riser Systems are the most economical, easy to install and efficient method of constructing tiered seating in the market. The SSE Systems are installed late in the construction sequence allowing the subcontractors to finish all the high work above the platform areas without the need to scaffold over the riser platforms. Because of the detailed SSE shop/installation drawings and the logical assembly of the PREFOAM Stadium Seating Riser Systems, the installations lend itself to the economical use of lower skilled labor when applicable. Sharing their experience gained through the installation of hundreds of systems, SSE’s management is hands-on with the general/subcontractor’s field crew from preconstruction through the final concrete pour to insure that all questions are promptly answered. SSE personnel will conduct a pre-installation meeting via teleconference for each project to review the details of the installation and any nuances inherent to each particular project to insure that the installation contractor is ready to “hit the job running” on the first day of the PREFOAM Stadium Seating Riser System delivery. SSE’s coordination of material delivery allows the contractors to schedule “just-in-time” deliveries of the material to the jobsite. The SSE Project Coordinator will work directly with the installation crew to make sure material is delivered based on your schedule. The use of the SSE PREFOAM Stadium Seating Riser Systems provide benefits to the entire project team from architects and engineers to facility owners to general and subcontractors. Our best references are our clients. We work hard to earn their trust, respect and repeat business. “I just wanted to drop you a note of appreciation for your excellent performance of this our second project with SSE. 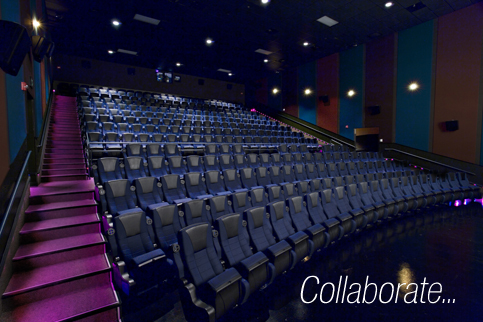 Both the Frank Theatre and the Penn Cinemas IMAX projects went together just like their design. Having never before worked with your foam riser system, I had some reservations as we started the first project, but those reservations quickly went away.